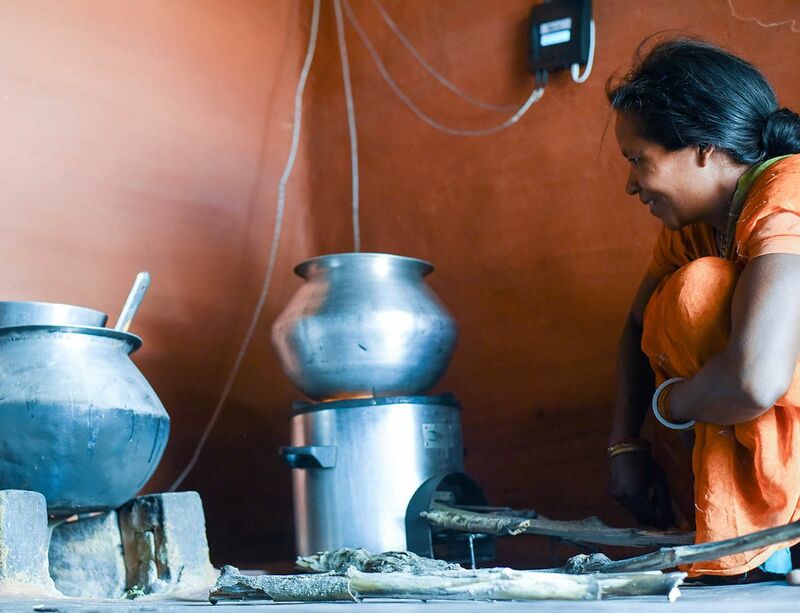 How It Works: The StoveTrace system uses data and money to incentivize women to use more efficient cookstoves. If there were a museum of good intentions, the massive effort to give improved cooking stoves to the global poor would have an exhibit hall all its own. About 3 billion people still cook their food on open fires or traditional stoves (typically a few mud bricks on the floor), which release plumes of soot into the air. These emissions of black carbon are noxious, particularly when the cooking is indoors, and they also add to the global greenhouse effect. The World Health Organization estimates that nearly 4 million people die every year from illnesses related to household air pollution, and some climate researchers argue that black carbon is second only to carbon dioxide (CO2) in its contributions to global warming. The answer seems clear: Give those 3 billion people clean-burning stoves! Many philanthropic groups, including the sprawling Global Alliance for Clean Cookstoves, have poured millions of dollars into such initiatives. That alliance, backed by the United Nations Foundation and dozens of governments, corporations, and foundations, has helped local groups distribute some 80 million cookstoves around the world since 2010. Smoke and Soot: When women cook on traditional stoves, their fires produce black carbon, which contributes to lung and heart diseases—and to climate change. So how can do-gooders change that trajectory? Look to a project in the eastern India state of Odisha that’s been funded by the telecom company Qualcomm since 2009. The project, called StoveTrace, uses data and money to tackle the biggest problem in every clean-cookstove campaign: getting women to alter their behavior and actually use the new stoves they’re given. StoveTrace combines economic and technical strategies. A local “energy entrepreneur” gives loans to village women that allow them to buy efficient cookstoves for the equivalent of about US $80. With that purchase, Ross explains, the women get a feeling of investment. The stoves, which look like metal cylinders, are various kinds of “forced draft” appliances that draw in air to make the fire burn hotter and cleaner. A Better Way: This stove requires less fuel for cooking, because it draws in air to make the fire burn hotter and cleaner. A thermal sensor registers the stove’s usage and sends the data to a monitor mounted on the wall. Each stove is equipped with a thermal sensor that registers when the stove is in use. The sensor is wired to a small, wall-mounted communications module, which records the data. In the project’s first iteration, that module sent information to the cloud in real time via the cellular network. The next version uses a cheaper and simpler gadget, which stores the data until the local entrepreneur comes by and uses Bluetooth to connect to the module and download the data. The emphasis on data and monitoring sets StoveTrace apart from other well-intentioned projects, says Anirban Mukerji, a New Delhi–based senior manager of Wireless Reach, Qualcomm’s corporate social responsibility program. “The Global Alliance for Clean Cookstoves has reported in their 2017 annual report that over 80 million stoves were distributed in the 2010 to 2016 period, but we really don’t know how many of those stoves are working and being used regularly,” he says. “It’s a black box.” StoveTrace’s sensors enable the local entrepreneurs to see if the new stoves are actually being used in each village; if not, these local workers can return to a village for troubleshooting or repairs. Daily Data: The StoveTrace program records each woman’s use of her new stove. If she stops cooking with it, a local program manager will see this sign of trouble and can go to the village for troubleshooting or repairs. The sensors also serve a second purpose. Based on each woman’s stove usage, she’s given small monthly payments via a mobile banking app on her phone: A woman who cooks regularly on her new stove receives the equivalent of around $4 per month. These payments are considered “climate credits,” disbursements that are linked to beneficial actions to combat climate change. Nexleaf argues that each woman is reducing overall greenhouse gas levels in the atmosphere by reducing deforestation, allowing trees to take up and store CO2, and by reducing emissions of sooty black carbon. With the money, the woman makes installments to pay back her loan (which typically takes about two years)—and any leftover money is hers to spend as she sees fit. But the payments are also the biggest barrier to scaling up the project. Currently, the climate-credit payments are funded by Nexleaf’s philanthropic partners. Nexleaf has been piloting the project in seven Odisha villages, and the organizers are now preparing to expand to about two dozen villages in the Indian state. They’re also preparing to launch StoveTrace in Nigeria. Nexleaf’s Ruiz says she’s confident that the model is scalable, but others aren’t so sure. Putting It All Together: A worker explains the StoveTrace system to village women. Based on their usage of their stoves, the women will receive monthly payments via a mobile banking app.